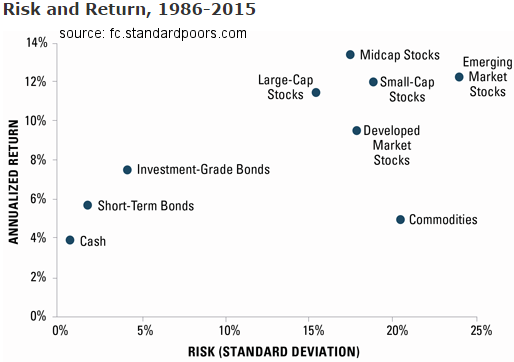 The chart above shows the risk and return of various asset classes over the past 30 years. The performance shown includes reinvestment of any income or distributions. Large-cap stocks are represented by the S&P 500 index. 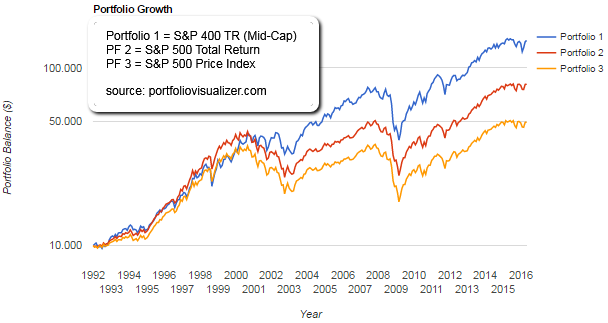 Midcap stocks are represented by the S&P MidCap 400 index. Small-cap stocks are represented by a composite of the CRSP 6th-10th decile portfolios and the S&P SmallCap 600 index. Developed market stocks are represented by the MSCI EAFE index. Emerging market stocks are represented by the MSCI Emerging Markets index. Investment-Grade bonds are represented by the Barclays U.S. Aggregate index. Short-term bonds are represented by the Barclays 1-3 Year Government/Credit index. Cash is represented by a composite of yields on 3-month Treasury bills, published by the Federal Reserve, and the Barclays 3-Month Treasury Bills index. Commodities are represented by the S&P/Goldman Sachs Commodities index.